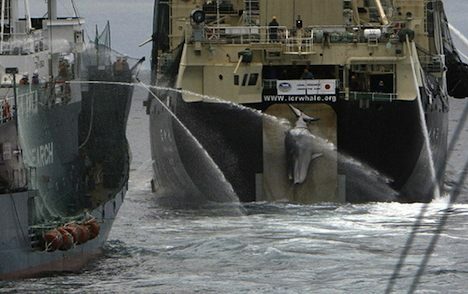 The Japanese whale hunt is back in full force this year, leaving port under heavy guard as it plans to kill nearly 1,000 whales in Antarctic waters, despite expected clashes with members of the Sea Shepherd marine conservation group. Three ships left the Shimonoseki port in southwest Japan, using 2.28 billion yen from a government fund set aside for earthquake relief. This is on top of the $6m annual subsidies already given to the industry. The fisheries agency tried to justify the funds by saying one of the towns destroyed by the tsunami was a whaling port. Japanese whalers typically leave for the ocean in December and return in April, but the agency refused to confirm whether the fleet had left, or even say how long it would remain at sea. The fleet has clashed with Sea Shepherd activists quite frequently over the past several years, with one receiving a suspended prison sentence after boarding a whaling vessel to protest against the destruction of the group’s speedboat. The Sea Shepherd claimed victory last year after its harassment forced the fleet to return a month early with 172 whales, one-fifth of its annual goal. As a result, whalers have asked U.S. courts to take action against Sea Shepherd activists to prevent them from encroaching on their work. The goal for this season is to kill over 900 minke whales and 50 fin whales. This is within regulations put forth by the International Whaling Commission, allowing Japan to kill a limited number of whales for “scientific” purposes. However, the IWC also allows meat from these expeditions to be sold to supermarkets and restaurants, yet another reason for environmentalists to condemn the practice. Some say whaling is slowly dying out and losing popularity with the public, and if Sea Shepherd activists continue to be heard, this could even be the last whaling season ever. What do you think?